It took me forever to finish these... in between about 9 other projects. I love this pattern. It was written by the proprietor of my LYS. 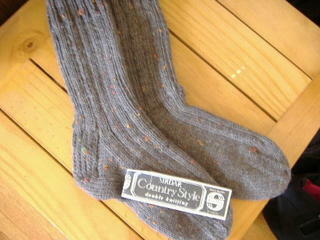 As you can see they are done in Sirdar Country Style DK weight. They will be warm. If anyone wants the pattern, let me know and I'll email you how to get it. The socks look comfy!!! Who are they for?